In Thinking Mathematically, Sixth Edition, Bob Blitzer’s distinctive and relatable voice motivates students from diverse backgrounds and majors, engaging them in the math through compelling, real-world applications. 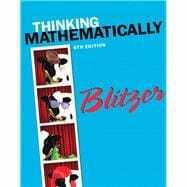 Understanding that most students in a liberal arts math course are not math majors, and are unlikely to take another math class, Blitzer has provided tools in every chapter to help them master the material with confidence, while also showing them the beauty and fun of math. The variety of topics and flexibility of sequence make this text appropriate for a one- or two-term course in liberal arts mathematics or general education mathematics. Bob Blitzer is a native of Manhattan and received a Bachelor of Arts degree with dual majors in mathematics and psychology (minor: English literature) from the City College of New York. His unusual combination of academic interests led him toward a Master of Arts in mathematics from the University of Miami and a doctorate in behavioral sciences from Nova University. Bob is most energized by teaching mathematics and has taught a variety of mathematics courses at Miami-Dade College for nearly 30 years. He has received numerous teaching awards, including Innovator of the Year from the League for Innovations in the Community College, and was among the first group of recipients at Miami-Dade College for an endowed chair based on excellence in the classroom. Bob has written Intermediate Algebra for College Students, Introductory Algebra for College Students, Essentials of Intermediate Algebra for College Students, Introductory and Intermediate Algebra for College Students, Essentials of Introductory and Intermediate Algebra for College Students, Algebra for College Students, Thinking Mathematically, College Algebra, Algebra and Trigonometry, Precalculus, and Trigonometry all published by Pearson.